New EU Intergroup for Islands as well as Seas, Rivers, and Coastal areas. At long last, there will be an Intergroup in the EU parliament that will look into Island issues specifically. although as part of a wider remit. The Seas, Rivers, Islands and Coastal Areas Intergroup of the European Parliament was proposed to Martin Schulz by the Presidents of the Political Groups and has been approved by the Conference of Presidents. It will carry on and further develop the work led under the Seas and Coastal Areas Intergroup, which the CPMR had strongly supported since 2010 acting as its Secretariat. Gesine Meissner (DE-ALDE) is the new President of the Intergroup that met for the first time in Strasbourg on 15 January 2015. Members of the Intergroup also voted for the Vice-Presidents responsible for thematic and geographic priorities that will include the sea basin strategies and the island dimension. Different political groups and nationalities will contribute to the work of this renewed Intergroup that will carry on and further develop the work led under the Seas and Coastal Areas Intergroup. In close cooperation with the CPMR, the Intergroup will promote an integrated approach to issues such as the relationship between blue growth and green growth, the European maritime industry. The attractiveness of maritime professions and the sustainable development of coastal areas will also be covered. Particular attention will also be given to the sea basin strategies and the island dimension. “This is very good news for the whole of maritime Europe, to which the CPMR belongs, and a just recognition of the work led by members of the Seas and Coastal Areas Intergroup during the previous legislature. This shows that the European Parliament acknowledges how vitally important the seas and coastal regions are for the future of Europe. The Intergroup, working together with our maritime regions, will be able to put forward concrete proposals to the Commission and the Council to develop the tremendous potential of the sea in a more responsible and sustainable way,” stated Vasco Alves Cordeiro, President of the Regional Government of the Azores and CPMR President. The 2014 Community Energy Scotland conference held in Edinburgh last November reiterated that point very strongly. Existing grid constraints unlikely to be resolved quickly means that today more than ever, community energy makes sense. In the context of Scotland’s extensive fuel poverty which is particularly acute in the islands, ‘community energy can directly impact on high fuel costs’ said John MacDonald of Comhairle nan Eilean Siar, as he outlined plans to set up the first Hebridean Energy company supplier. One particularly inspiring story was told by Alan Hobbett about a group of housing associations in the Scottish Borders addressing fuel poverty by getting into power generation themselves. Orkney again showed how they lead the way in community led smart demand side management. ‘We want to use the curtailment system to show that we can bring to the grid 500 kW that will benefit communities,’ said speaker Brian Clegg from Hoy. It was also inspiring to see solidarity with the developing world at work with the presentation of the CES work in Malawi. Nicholas Gubbins, Chief Executive at Community Energy Scotland has pledged his organisation to supporting more local energy economy projects in 2015. The charity Community Energy Scotland has led the movement for more local ownership and benefit from renewable energy for more than ten years. ‘The Local Energy Economy concept encompasses wise use of energy as well as renewable production. Joining up the thinking around energy efficiency and tackling the high cost of heat for many householders is driving our thinking,’ added Nicholas. Community energy activists are not about complaining but rather positive action. They can see the successes of the early community energy projects and want to take a further step, generating the power and heat their communities need in the way their communities want. See www.communityenergyscotland.org.uk for the 2014 conference papers and the help CES can deliver to communities interested in developing their own energy solutions. In Project SMILEGOV, the Scottish Islands Federation (SIF) leads the capacity building involvement of 10 island communities in the project, participating alongside other cluster leaders and islands throughout European Atlantic, Baltic and Mediterranean regions. Individuals on each of these islands, together with key staff in their respective local authorities have been invited to register and encouraged to study with SMILEGOV’s free online island energy training course. 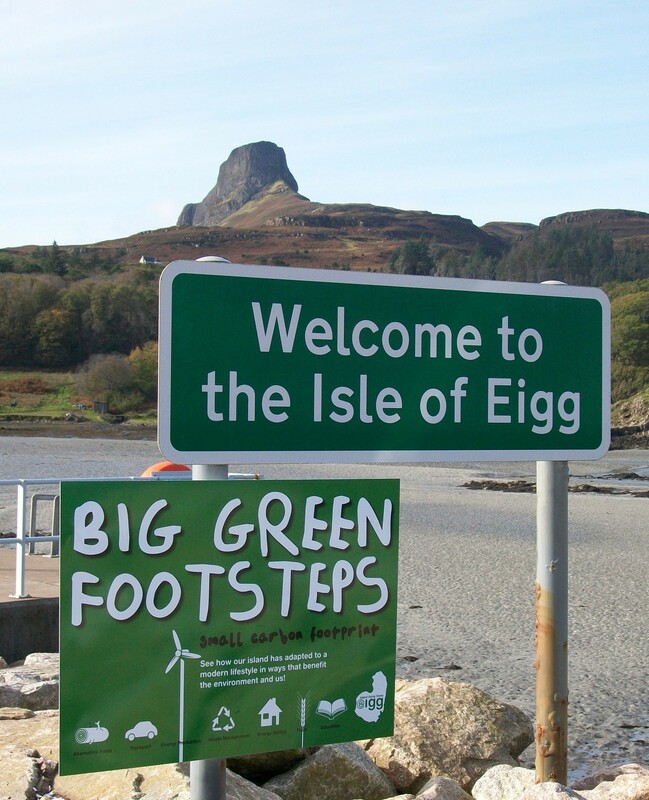 Additionally, through a CARES project also led by SIF, energy audits are currently being undertaken on each island, with mentoring support for island auditors supplied through Community Energy Scotland. It is anticipated that these reports will serve as the basis for stakeholder meetings early in 2015, to expedite practicalities of preparing Island Sustainable Energy Action Plans, to inform, shape and focus island energy projects into the future. SMILEGOV recognises a somewhat distinct model applying in Scotland compared to other clusters: Here, energy projects are often planned and implemented by island communities on their own behalf, supported rather than led by Local Authorities. Community engagement (such as we might take for granted as our starting point) seemingly presents challenges for some local government agencies leading energy projects on islands elsewhere. For the remaining duration of SMILEGOV, monitoring and supporting Bankable Projects within clusters is an important activity, reporting to allow for wider sharing of expertise and experience both within and between clusters. This may be in terms of planning, financial models, grid constraints, stakeholder engagement, or specialist and emergent technologies. Great editorial in The Herald, putting recent stories about the community-owned island of Gigha in context. 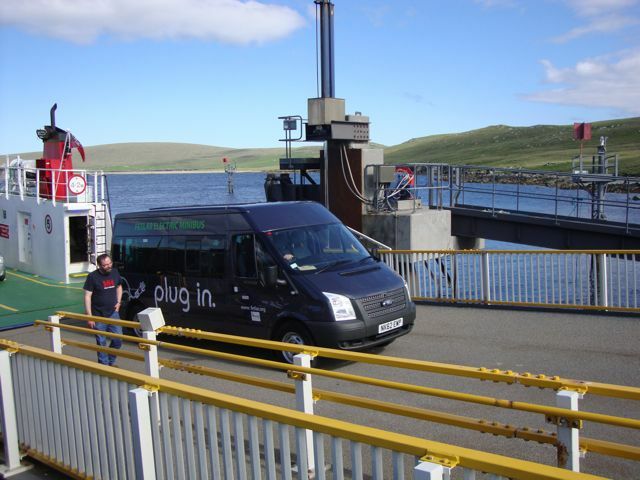 Read also about Gigha’s innovative battery storage project in islands going green. “Noone said community ownership of land would be easy. When the people of Gigha completed their £4 million buyout in 2002, they were able to wave goodbye or should that be good riddance? to private landlords, but took on what was in effect a major business. All businesses face challenging periods and have to balance the imperatives of investing in the future with keeping debt levels sustainable, so it is not altogether surprising that after making much needed improvements, the Isle of Gigha Heritage Trust has debts of £2.7m. Importantly, it also has assets of £7.5m. There would have been little point to community ownership unless housing stock renovations were carried out. A report prior to the buyout found threequarters of the estate’s 42 houses should not be lived in, while nearly all of the rest were “in serious disrepair”. Housing renovation does not come cheap, but the trust has also invested in income-generating technology, installing four wind turbines that trust chairwoman Margaret McSporran says have already earned the island more than £800,000. So Gigha’s debt was accrued making the island a much more attractive place to live; indeed, its population has gone up from 96 to 170 since the buyout. The strong backing given to Ms McSporran this week by islanders suggests that the community appreciates the scale of the task and the work the trust has done. That is not to say the debt is not significant. It is understandably a worry to many islanders and must be tackled. A strategic review of the organisation has warned it is unsustainable, based on current revenues and that immediate action is required to turn things around. It is to the trust’s credit that it is wasting no time. Ms McSporran has already announced reforms of the trust’s governance and management of debt, and its intention to attract more people to the island, which is seen as important for its economy. Other planned measures include doing more to bring in tourists, including by seeking experienced hotel managers to lease the hotel. Good luck to the trust in these endeavours. Gigha’s problems have come to light just as the new First Minister has announced she wishes to ensure Scotland’s land is an “asset that benefits the many, not the few”. She plans to end business rates exemptions for shooting and deerstalking estates in order to more than treble the Scottish Land Fund, allowing for much more community ownership. Putting more land under community control is a noble aim and one that has strong public backing. Gigha’s recent experience, while highlighting the challenges community trusts face in managing such complex enterprises, certainly does not undermine the validity of the model. After all, private companies go bust without it prompting a reevaluation of capitalism. The Isle of Gigha Heritage Trust has a major task ahead to get back to financial health, but it has a proud record on which to build. More from David Ross at the The Herald. News that the community trust which has owned the island of Gigha for the past 12 years, faces some financial difficulties was widely reported this week. It seems however that with an assets portfolio recently valued at around £7.5m, the position may not be so pressing as it once appeared. Indeed there are many in the land who would be delighted to think their house was worth almost three times the outstanding mortgage on it. Talking of houses when the community was buying the island, a housing conditions survey highlighted the scale of the task ahead. It found that of the 42 houses that came with the estate, 75% were classed as “below tolerable standard” and should not be inhabited, while 23% classed were “in serious disrepair”. “If we put in a nail or a hinge, or put a slate on a roof, we will have done a bloody sight more than has been done for decades under our landlords,” Willie McSporran who was to become the trust chairman said at the time. Meanwhile it also revealed a high level of hidden homelessness, parents or siblings providing homes for adults. Now well over 30 of the properties have been renovated. Around £160,000 has been spent on each of the houses, with 60% coming in the form of grants and the rest raised one way or another by the community. In 2011 the community’s efforts were recognised by the Chartered Institute of Housing in Scotland, with its prestigious Excellence in Regeneration Award. These houses alone must be worth over £4.5m. Money was also spent adding a fourth wind community turbine to the island’s “Three Dancing Ladies” which were already earning over £100,000 a year. So Gigha has been a story about investment, albeit one which could have been written with different chapters on borrowing. It is a story of an island stemming generations of depopulation. But the possibility of one of Scotland’s headline community buyouts becoming financially troubled has always been a possibility, just as any privately owned business or estate can get into difficulty. But supporters of the community land movement have long been concerned about the likely response from some self-appointed guardians of the public purse. The Carnegie UK Trust commissioned Professor Hunter to write the story of community buyouts over the past 20 years, and “ From The Low Tide of the Sea to the Highest Mountain Tops” was published in 2012. And for those who questioned whether public money should be spent on the buyouts, Professor Hunter had some comparisons. The £30m total from public and lottery sources which helped take half-a-million acres of land into community control over two decades, was equivalent to the bill for only 600 yards of Edinburgh’s tramlines. In fact it amounted to less than 7% of the cost of the five-mile M74 completion stretch of motorway in Glasgow and matched the subsidy farmers and landowners receive in Britain every three or four days. Money well spent or what? The Scottish Islands Federation welcomes the restoration of the island minister post for which it has long been campaigning. Derek MacKay who has been appointed to the post, previously chaired the Islands Area Ministerial Working Group which produced the Prospectus for Islands, undoubtedly the most comprehensive package of powers for island communities ever produced. Relaunch of Islands Area Ministerial Working Group. Here is a link to download the full document: Empowering Scottish Islands Communities. One of the ambitions of the forthcoming Community Empowerment Bill is to increase the number of communities who take on land with a view to growing food. Horshader’s Community Growing Project was awarded the prestigious 2014 SURF Award for Best Practice in Community Led Regeneration on 2/12/14. The project was praised for its inspiring work by Paul Wheelhouse MSP, Scottish Government Minister for Community Safety and Legal Affairs. The Community Growing Project was set up in January 2014 by Horshader Community Development to serve the villages of South Shawbost, Dalbeag, and Dalmore on the West Side of the Isle of Lewis in Scotland. 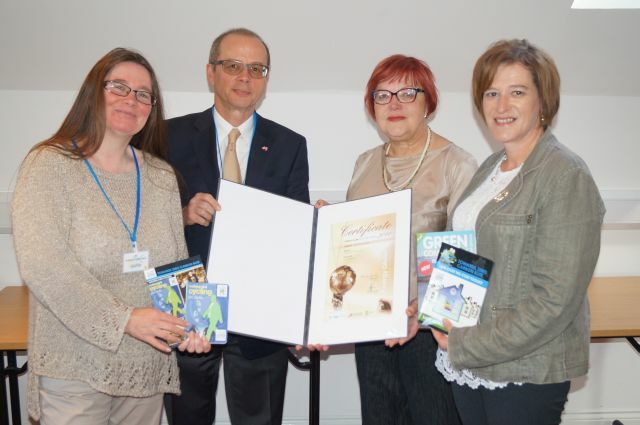 It established an innovative community-led partnership through the Ideas Bank to develop a sustainable project which also demonstrates efficient use of public funding. 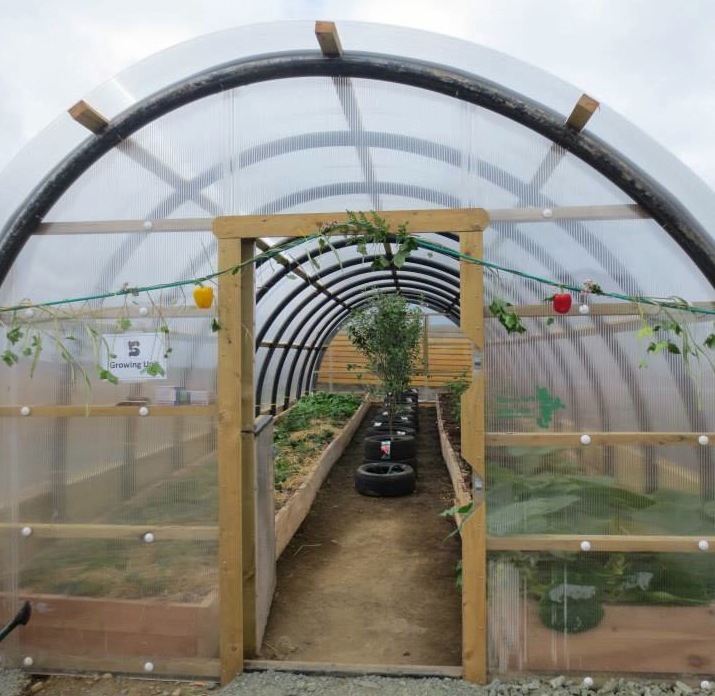 Horshader Community Development received grant funding from the Climate Challenge Fund and Comhairle nan Eilean Siar to erect allotment polytunnels in the area and fund two local jobs. A full time Project Worker is responsible for the growing unit and producing a plan for providing fresh fruit and vegetables which will be distributed through a market garden initiative. A part time Outreach Officer is also be employed and be responsible for organising and delivering a programme of events and activities to encourage the reduction of carbon emissions. The project provides four food-growing polycrubs that will supply year-round fresh fruit and vegetables for the community. It will also provide an accessible covered space for community members to grow their own produce in the form of two allotment tunnels, one in South Shawbost and one in Dalmore. Ordinary polytunnels would not last long in the exposed climate of the island of Lewis. For this reason, polycrubs, made out of recycled feed pipe from salmon farms and polycarbonate sheeting have been sourced from Nortenergy in Shetland where they have withstood gales of up to force 12. Whilst an updated grid connection is in the pipeline for 2015 / 2016, this presented an ideal opportunity to research and prototype an Energy Storage System to release the full potential of the turbine. A consortium led by REDT (Renewable Energy Dynamics Technology Uk Ltd) have been successful in gaining DECC funding for such a project. The Vanadium Redox Flow battery is due to start working in June 2015. It provides an innovative solution to an increasingly common problem by allowing a behind the meter flow battery to store any excess power and release this power when the wind drops and the capacity on the grid is available. Its primary role is to capture currently constrained energy, charging at low cost, discharging at high cost, but it will also allow Gigha to run as closed system when the national grid is not present, by providing a temporary grid for the turbines to run. This is the first battery of this type to be installed at this size in a working capacity and will provide valuable insight into the technology and its real world implementation. For more details on this project, see the presentation by Andy Oliver of Gigha Green Power in the 2014 conference reports on the Community Energy Scotland website.